I found my passion in metal art. You know, that thing that drives everything you do and gives you a purpose to life. That driving force behind each day the minute I lift my head off of my pillow and the last thing I think about before I go to sleep. I feel the compulsive need to keep going and I find it impossible to walk away from a piece until it is finished. Not only do I draw inspiration from music as I create a piece, but I find I get inspiration from the metal itself. The way the metal bends and flows in such a soft feminine way and then I throw on my helmet and melt the metal together with the spark of the welder that is so hot it burns you if it falls on you, and I am reminded of what a tomboy I really am and I love it. When I walk back in the door from working on my art ,you can see the black soot from the welder I might have wiped across my cheek from my glove and the paint I have wiped on my sleeve, in a careless, impulsive moment that I was too busy doing my art to notice, and you can tell, I am truly an artist. I am the kind of artist that lives in the moment. I create from an artistic intuition that I didn't even know I had until I began working with sheet metal. Born and raised in Calabasas, California, I went to typical schools and lived in nice houses, in great neighborhoods, with European parents. I never quite felt like I fit in anywhere though. Being from Calabasas but growing up going to Holland and England in the summers ,I was never really all American but also never really European either. I have always liked building and construction and using power tools but never saw how I could do that as a career so I worked on my house whenever I could and was remodeling one day, when Omar Wysong, a metal artist, walked by. While we were talking, he mentioned he has a successful Etsy shop and does metal yard art and he needed help with cutting and welding the metal pieces. I had an intuitive nudge that I needed to work with him and that's what happened.I found that I had a knack for cutting steel, it came naturally to me and Omar taught me how to weld. One day, as I went to throw the scraps of metal away that were left over from the steel agave design I had just cut, some of the scraps fell on the floor and I saw something beautiful in the way they had fallen. So I asked if I could take the left over metal that was being thrown away because I wanted to make something for my freshly painted ,bare white walls.He said sure, no problem, grab what you want and I went back to my house and made a metal wall sculpture. I was surprised at the result of the piece I had created. I started to play around with making another one. This time I painted the metal and found I had a talent for this as well. My fiance said I could use his welder which had been sitting in his shed still in the box and I swear I have not been able to stop welding and painting ever since. It has awakened my spirit and filled me with a new found energy of hope to realize my true purpose and calling in this life. I felt an unbearable emptiness before discovering this talent. Something that is very hard to explain to others that don't feel like that in their everyday life. Now I am happy and content and proud to call myself a welder and metal artist. I am fulfilled and driven and feel like I have found the missing piece to my whole being. Currently I live in Los Angeles with my very supportive fiance and three kids. 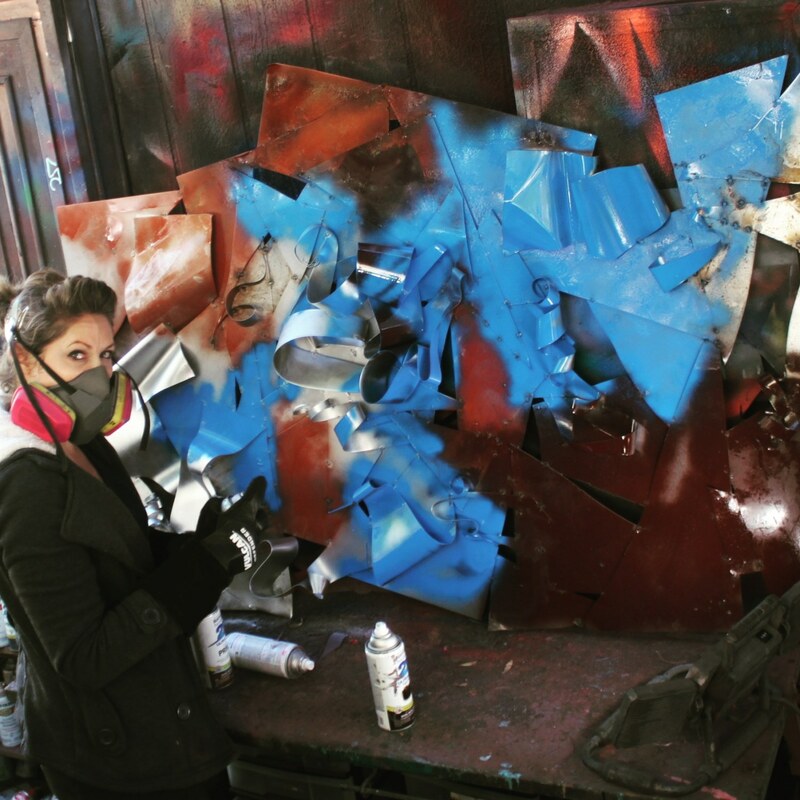 I work from home where I have created my art studio and welding area in our backyard and where I spend countless hours totally absorbed in my artwork.